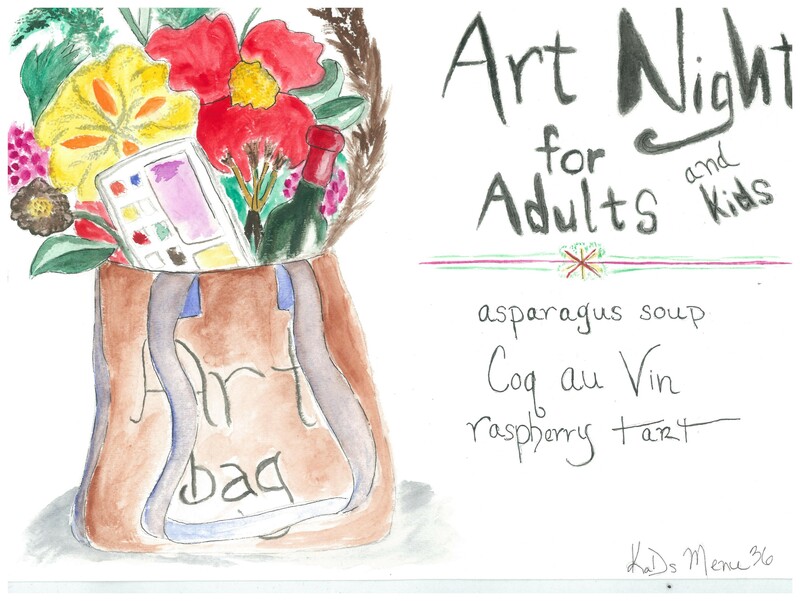 Menu 36 – Host an Art Party! SaveGourmet is an exciting project for numerous reasons. One of the most satisfying elements of this project has been working on a drawing every week. What to draw? How to represent a meal / a theme in an illustration? Once I figure out what to draw, I have to figure out how to draw it. I am (clearly) not a trained artist, so settling on drawing a crab, for example, means I actually have to figure out how one might draw a crab. For me, this process is fun, immersive and meditative. The benefits of coloring are well documented. This week let’s take that a step further and pick up a pencil and actually draw something. Anything. A flower. Your computer. The mug on your desk. A sphere. For most of us, there comes a sad time in our lives when we eliminate drawing from our activity set, probably around 5th or 6th grade. My kids draw all the time. Why not adults? People say “oh I cannot draw” or “I am not an artist.” Who says! I challenge you right now to stop reading and draw whatever is sitting in front of you. Your phone, most likely (amiRIGHT?). Everyone draw an iPhone – take two minutes. Back now? Wasn’t that fun! Is it terrible? Who CARES. You made something. The world now has you re-thinking your role in it – not just consumer, but creator. Let’s not be defeatist. Let’s not assume crayons are just for kids. Make it easy – host a party, an art party, where you set up a still life and other random objects on a table. Lay out watercolors, crayons, pencils, erasers and markers. Send the kids out back to play (because that is what they do – play) and all of the adults sit around your table and draw for an hour. That’s right, an hour. It’s a little silly and nerve-wracking, so serve some cocktails to loosen everyone up but I guarantee people will surprise themselves. And then, eat. Since we are making everyone think of themselves as artists, let’s make dinner a French theme (I know artists are from all over the world, but let’s give France a little shine – when I think of France, one of the top three things that comes to mind after Food and Wine is Art). This is not a hard menu and, as is often my custom, it is best made ahead. Start with springy asparagus soup. Pretty, green, easy. Next, coq au vin over buttered noodles. Something of an old school dish – a classic and you can’t go wrong. Last, serve a wonderful raspberry tart. I have made this one several times and it’s delicious, and pretty with the green pistachios sprinkled over bright berries. Happy Spring and happy creating, friends! Oh and if you want a quick read on art benefits, read this article http://jamesclear.com/make-more-art from James Clear. He says it better than I can and references medical studies backing this up. Then close your phone and pick up a pencil.